One of the big problems with the home computer boom in the 1980’s was that you needed to have a TV set to plug your Spectrum or Commodore 64 into. Nowadays of course every kid from the age of 3 upwards seems to have a 14 inch colour TV and DVD player in their bedroom, but not so back in the 1980’s, as colour TV sets still cost a fair amount of money. In our house we had our main colour TV set in the front room, and a little 8 inch black and white TV that my Dad had bought years ago. It was so old it had inputs on the back to allow it to be powered by a car battery as well as the mains. I received a Commodore Vic 20 for Christmas one year, and whilst I was allowed to use the colour TV on Christmas Day, by Boxing Day my Mum wanted to watch TV so the black and white set was got down out of the attic. Obviously it wasn’t as much fun playing games in black and white, but never mind, I wanted to use the computer, so that was my only option. The following Christmas, when all my other toys had been discarded, the Vic 20 was still my most favourite thing and so Mum and Dad bought me my own TV set for my room. It was still only black and white, but it was a 12 inch set, which was a huge step up from what I had been using. 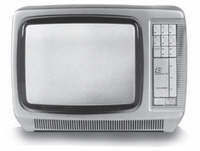 I loved that TV, not just for playing on the Vic but also for watching TV after bed time. It was encased in white plastic that you could bend with only the slightest pressure, yet it was sturdy enough. The power switch doubled as the volume control, and to tune it in to a particular TV station you had to turn a dial, a bit like on a radio, to select the correct frequency. It came with one of those metal loop ariels that you would have to wiggle around to get a decent reception. On school nights we had to be in bed by 9pm, but Mum and Dad were quite relaxed about things and allowed us to watch TV for an hour or so in bed if we wanted to. I remember sitting in bed watching Minder (even though I was really too young at the time) and Pot Black on BBC2, as I really wanted a Snooker table at the time. Pot Black was particularly difficult to watch, as trying to follow Snooker in black and white is obviously a bit awkward at times. There was always that joke about the Snooker commentator who said, “and for those watching in black and white, the pink is the one just behind the green”. Thanks for that! What a great help! This entry is filed under Miscellaneous	and was posted on January 4th, 2008. You can follow any responses to this entry through the RSS 2.0 feed. You can leave a response, or trackback from your own site.